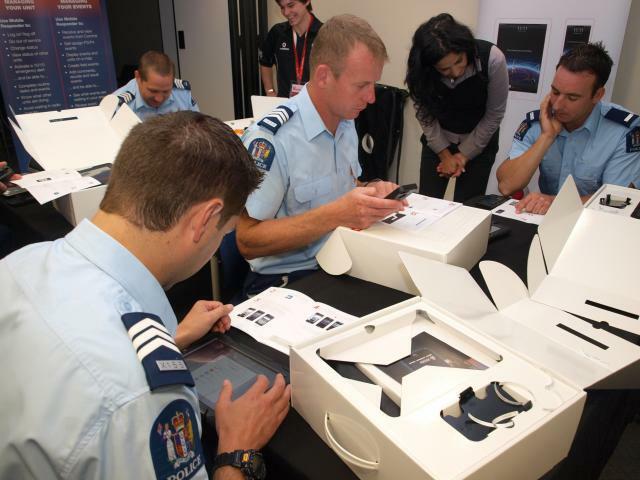 Having a more mobile, visible frontline Police presence focussed on crime prevention gains more impetus from today as the first group of officers start receiving their iPads and iPhones. From today until early July this year, the process begins for frontline officers to receive their mobile devices in a district-by-district roll out. In mid February it was announced 6086 frontline response, investigation and community Police officers would receive an iPhone and 3900 of these staff - who have more complex data entry needs - would also receive an iPad. Deputy Commissioner Operations, Mike Bush says a cascade approach will be used to distribute the mobile devices. Throughout April, three pre-trained implementation teams will distribute the devices and train around 400 selected staff spread throughout the 12 Police districts. From early May, the three implementation teams and the selected district staff will then roll out and introduce the devices to the remaining staff. Online training material and user guides will complement the face-to-face support. Wellington District staff will be the first to receive their iPhones and iPads in early May. “It’s no small logistical task to physically distribute the hardware to staff on shiftwork and get them familiar with their devices,” says Deputy Commissioner Bush. Use of the devices will mean frontline staff gain approximately 30 minutes of productivity per shift which equates to 520,000 hours per year. The expected time savings will be reinvested into preventative policing activities – in keeping with the Police ‘Prevention First’ operating strategy. Rob Lee (04) 470 7348.